It’s a fun bit of trivia that George Bernard Shaw is the only person to have won a Nobel Prize for Literature and an Academy Award. He secured the latter for a truly brilliant adaptation of his own stage play: 1938’s Pygmalion. The plot: Eliza Doolittle is a poor Covent Garden flower girl (Wendy Hiller) with a lower-class accent thicker than a London fog. 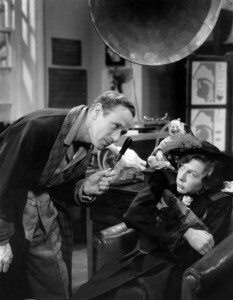 She is taken on as an experimental subject by imperious, brilliant and eccentric language expert Professor Henry Higgins (Leslie Howard), who intends to pass off this “squashed cabbage leaf” and “incarnate insult to the English language” as a fine, upper class lady. Higgins doesn’t do this out of kindness, but because he wants to show off his abilities as a language and etiquette coach and along the way to win a bet with his friend Colonel Pickering (Scott Sunderland, in an appropriately warm portrayal of upper-class decency). The result is abject hilarity underlain by Shaw’s caustic observations on social class hierarchies. There is also, infamously, a strange romance which resolves in a fashion that is still much debated. There is so much to praise in this movie! Shaw’s peerless source material is only the beginning of the joy for audiences. Co-Directors Leslie Howard and Anthony Asquith give a clinic in how to open up a play with the possibilities of film. Howard is also an antic marvel on screen, consistently watchable and funny without making Higgins more sympathetic than he should be. But as good as Howard is, and he’s very good, the then-unknown Wendy Hiller is a revelation. She had garnered raves for her Eliza on stage and it’s easy to see why. She wrings all the laughs out of the part but also portrays heart-touching vulnerability and fiery spirit. She later won an acting Oscar for Separate Tables but this is her performance of a lifetime and ranks with the best 20th century turns by a British film actress. This is also a good-looking film, especially if you treat yourself to the restored Criterion Collection version. Cinematographer Harry Stradling Jr. had a fine eye for London life from its poshest to grimiest bits, and he was aided by a soon-to-be famous film editor named David Lean. Pygmalion is near-perfect cinematic entertainment that remains tremendously appealing today. And though it doesn’t sound or look as good as The Criterion Collection version, you can watch a not bad copy of this public domain film for free at The Internet Archive. SPOLIER ALERT: Stop reading here if you haven’t seen the film. Above I wrote “near-perfect” to acknowledge the problematic ending of the movie. It’s an intriguing exercise to analyze this film from a feminist perspective, especially in light of Shaw’s original these-boots-were-made-for-walking conclusion being thwarted by the audience’s desire for a romantic ending. Other than Colonel Pickering, the leading men in this film treat Eliza deplorably. Her father is content to sell her cheaply into sexual slavery and Higgins browbeats her relentlessly while refusing to show her the affection she clearly craves. Eliza’s lovestruck suitor Freddy Eynsford-Hill is kinder, but is also a wazzock and unworthy life companion. How then can a modern audience stomach Eliza romantically capitulating to Higgins in the end? The audience at the time clearly saw this as a happy ending, much as they did a similar ending in a massively popular, similar film of the same period (The Seventh Veil – which is also worth a look on its own merits). I made my own peace with Pygmalion by interpreting the ending not as happy, but as realistic. Young, impressionable women do sometimes fall for older, wealthier, narcissistic men who are not good for them. In any event, the ending of the film need not be the ending of the story of these characters in our own minds, so I feel free to believe that Eliza will eventually be strong enough to throw off the oppressive life that the domineering Higgins intends for her, and you are too. Pygmalion's 'epilogue,' written a few years after the play's premiere, describes Eliza's future life with Freddie. Shaw hoped to end all speculation of an Eliza/ Higgins match-up. What's wrong with the epilogue? Audiences would be dying to know what became of the pair and Shaw tells us. I've loved Shaw's prologues and epilogues as exegesis on his plays, especially the prologue to Heartbreak House. It should be read after reading Tuchman's The Guns of August, as an explanation of how war-looney the British became over WWI. I have an idea – adapt this clever story into a musical comedy and take it to Broadway! Anyone know where I can find a producer? Of course, I would have to write a script first, and for that, all I want is a room somewhere …. Next Next post: Hurrah for Eric Holder!